Posted: Friday, September 26, 2014 8:12 am | Updated: 8:20 am, Fri Sep 26, 2014. At Lucky Nickel Ranch in Eloy, while another crop of snap peas, kale, cabbage and other veggies is soon to be planted, owner Michael McKenzie is battling the Pinal County Assessor’s Office to prove his small-scale organic operation is an active farm. Agricultural land classification for the 32-acre farm was revoked last year by the Assessor’s Office. McKenzie is appealing the decision and fears his property taxes will triple if he is not successful. “I’ve had my agricultural status for 15 years and suddenly, they’re revoking it, saying it’s not an active farm,” McKenzie said. In an area where large swaths of cotton and corn fields dominate, Lucky Nickel Ranch, which grows seasonal vegetables, is different. An organic certified produce grower, the ranch is also an incubator site for aspiring farmers. Student farmers spend time at Lucky Nickel Ranch, learning how to start a small-scale, organic operation, serve a niche market, find customers and turn a profit. Much of the ranch is divided into plots for students, with room for 40 future farmers. McKenzie, a Marine Corps veteran, has used the farm as a training ground for future farmers since 1999 when several Uzbekistan refugees spent time there learning about Arizona agriculture. Military veterans are also among the farm’s students. McKenzie works with veterans training programs to use the ranch as a launching pad for other veterans who want to start their own farms. County Assessor Doug Wolf would not comment on the specifics of McKenzie’s case, but said each year hundreds of people appeal the office’s valuation decisions. The state requires the Assessor’s Office to re-examine classifications in about 25 percent of the county every four years. People who think the valuations or classifications are not right may appeal. While the county Board of Supervisors can double as the Board of Equalization for appeals, Wolf said Pinal County uses a hearing officer from the state. In about 30 percent of appeal cases, the Board of Equalization rules in favor of the appellant. People who lose their appeal may challenge the board’s decision in state tax court, Wolf said. McKenzie will face the Board of Equalization on Oct. 1. He’s spent months trying to convince county officials to return the agricultural classification for Lucky Nickel Ranch, he said. 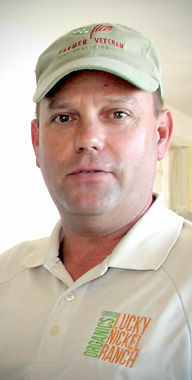 In responses to his appeal to the County Assessor’s Office, McKenzie said officials who surveyed his property referred to tractors he purchases at auction, repairs and lends to veterans and new farmers as “old farm junk.” His produce fields were referred to as “weeds,” McKenzie told the Casa Grande Dispatch. As well as a home, which doubles as a bed and breakfast, the property includes workshops, tractor storage, research and development fields and student plots, including one for an aspiring meat goat rancher. Time spent trying to correct his property classification has taken away from his time working the ranch and promoting his veteran farmer training program. “I should be on a tractor planting crops, but here I am spending time trying to prove to the county that this land is used for agriculture,” he said. Last year, Lucky Nickel Ranch planted 21 different vegetable varieties. This year, McKenzie wants to plant more. He plans to take his fight as far as it needs to go to get his agriculture classification restored. He hopes his supporters and fans of the farm training program for veterans show up at his hearing to support him and small-scale farms. “I’m just one guy on a tiny piece of dirt, with a handful of veterans trying to make a difference,” he said. McKenzie’s Board of Equalization hearing is scheduled for 1:20 p.m. on Wednesday in Pinal County Administration Building A, 31 N. Pinal St. in Florence. It’s open to the public. Reach Casa Grande Dispatch Reporter Melissa St. Aude at 423-8621 or mstaude@trivalleycentral.com. Sign up to receive email updates and to hear what's going on the farm.